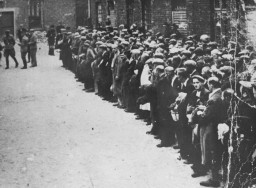 The Nazi camp system expanded rapidly after the beginning of World War II in September 1939, as forced labor became important in war production. Labor shortages in the German war economy became critical after German defeat in the battle of Stalingrad in 1942-1943. This led to the increased use of concentration camp prisoners as forced laborers in German armaments industries. Especially in 1943 and 1944, hundreds of subcamps were established in or near industrial plants. Subcamps were generally smaller camps administered by the main camps, which supplied them with the required number of prisoners. Camps such as Auschwitz in Poland, Buchenwald in central Germany, Gross-Rosen in eastern Germany, Natzweiler-Struthof in eastern France, Ravensbrueck near Berlin, and Stutthof near Danzig on the Baltic coast became administrative centers of huge networks of subsidiary forced-labor camps.